After a handful of albums, each of which saw an exponential growth of publicity, for Tinariwen little has really changed. A lot of myths have been perpetuated, most of which conveniently doubled as a stimulus to generate album sales in Western countries. 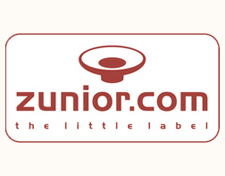 There was the idea that, since the band and their fellow travelers exchanged tapes of Bob Marley, Led Zeppelin and Santana, that they were somehow the African equivalent of those artists--one could equally argue that, since de facto leader Ibrahim Ag Alhabib built his first guitar after seeing one in a Western, he was some kind of African cowboy. There was also the romance of the “guns and guitars” backstory, the counterpoint being that the group only saw about six months worth of conflict and decades more of waiting, factions, broken promises, compromise, desperation. 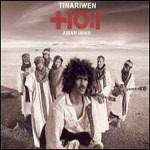 And if the idea that Tinariwen really carry appreciable traces of Western rock music is dubious, the idea that influence has spread the other way--that, as Chris Martin insists, the band inspired Viva La Vida (2008)--is almost laughable. The "returning to your roots" album is more of a romantic than aesthetic gesture too, but, with all the Bonos, Chris Martins and TVs on Radios singing your praises while simultaneously reaching for epic, "Important" rock, it’s the right one. Romance or not, the desert is firmly entrenched in their music--in many cases, posing as a vast expanse between them and home--and recording Imidiwan: Companions there, instead of in Europe and more populated areas of Mali like Aman Iman: Water is Life (2007), seems to have at the very least provided a good deal of needed inspiration. They’ve gotten noticeably more ragged: it’s hard to talk about their inspiration without understanding the lyrics, but you get the sense Alhabib especially is singing more through his own private struggle rather than for a greater cause, despite the title. The tried formula of having other singers echo each phrase is mostly intact, but on tracks like “Enseqi Ehad Didagh,” it seems like a private confessional first and foremost, the instrumention and background vocalists subtly accenting his loneliness. There’s a few moments on “Chegret” where his voice almost fades under the mix: it might be a mistake, but it resonates in a strange way, highlighting that uncanny slippage between laid-back and desolate that the band mines so well. Apart from these slight adjustments, again: not much has really changed. The most surprising turn is when Abdallah Ag Alhoussenyni does a kind of rap on “Tenhert,” which is incredible particularly because, rather than just going off, his stop-start flow punctuates the groove perfectly. “Intitlayaghen” is a highlight too, the vocals not so much singing the notes as sliding through them, that trait that makes the music of the Western Sahara so distinct and fluid. “Kel Tamashek” rides a single bass pulse with enormous gravitational pull. And that’s about it. I can’t think of another album I feel so little needs to be said about, and yet would so freely and gratuitously recommend to nearly everyone. 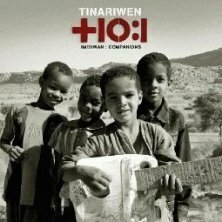 The thing that stands out for me this time around is how little Tinariwen are confrontational about their experiences. Instead, it just naturally permeates their music--love songs with a thousand-yard stare.